Flanken cut short ribs are great: the ribs are sliced across the bone, and you end up with thin ribs that only have a few round pieces of bone in them but are otherwise all meat. Let’s see what happens if we marinate them for a day in a simple cola & soy sauce blend. First of all, chop up the cilantro and green onions. You should end up with about half a cup of each. Then mince enough garlic to end up with two full tablespoons. Get a zip lock bag large enough to hold your ribs (or multiple bags if necessary). Place the ribs in the bag and add the chopped vegetables. Finally, pour in 12 oz of cola and 3/4 cup of Soy Sauce. Seal the bag, leaving enough air inside to be able to mix things up. Be careful, the cola is carbonated- you don’t want the bag to explode when you shake it up. Instead, turn it around until the marinade gets everywhere. Place the bag with the ribs in the fridge. 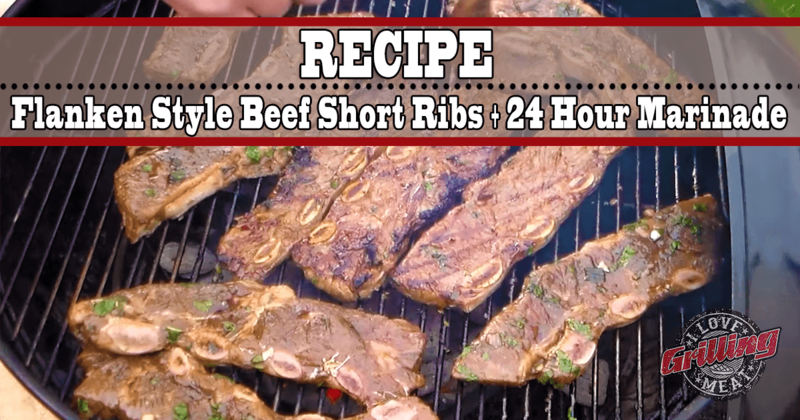 For the best results, let the meat marinate for 24 hours prior to cooking. In any case, set a timer at 6 hour intervals, and turn the bag over inside the fridge to help with the process. The next day, get the beef flanken style short ribs out of the marinade (you can reduce the leftover marinade to half if you want and use it as a glaze or dip). Don’t wipe or wash off the ribs, we want the little pieces of onion, cilantro and garlic to stick on the meat! Grill the ribs over direct heat. This cut is very thin, so about 3-4 minutes per side will do, turning them over every minute for even cooking. The sugar from the cola will caramelize and create a beautiful crust on the outside.